Q: What is the Time Series Forecasting feature? 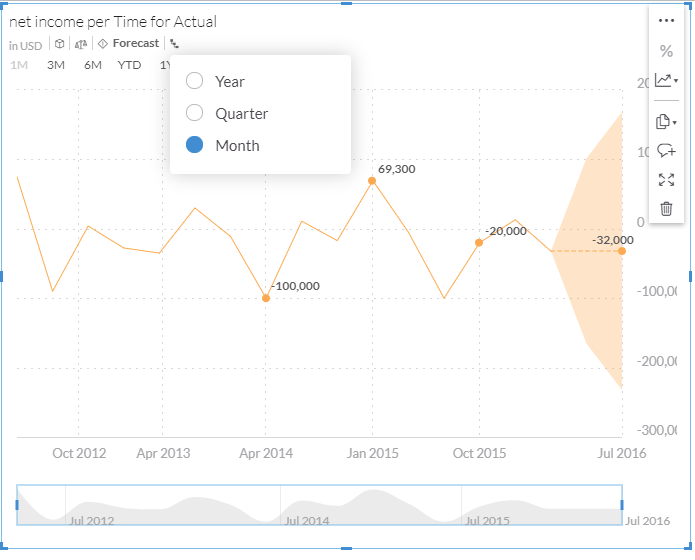 SAP Analytics Cloud allows you to create a visualization of data plotted against a time axis, known as a Time Series chart. In addition, the user may add a Forecast to the time series chart, which makes use of SAP’s proprietary forecasting algorithms to produce a forecast into the future. The indication of the forecast quality is provided (a number from 1 to 5 where 5 is the highest quality forecast), as well as the confidence interval for the forecast as generated from the forecasting algorithm. Q: What is Live Connection? The Live Connection feature allows a customer to make a connection from the SAP Analytics Cloud system into a HANA system or other data source in their local (on premise) landscape, in order to retrieve data into visualizations and stories in the SAP Analytics Cloud system. Supported live data sources include BW, S/4HANA, SAP HANA, and Universes. Q: How do I enable Time Series Forecasting on Live Connection? By default, Time Series Forecasting will not be enabled for Live Connection. The reason the feature is disabled by default is because the feature requires the data required to run the time series algorithm (on an aggregated level) to be transferred from the customer’s on-premise database to the SAP Analytics Cloud back-end system, and some customers may not want this data transfer to occur. If you would like to use Time Series Forecasting on Live Connection, it is necessary for a user with the Administration privilege to enable a configuration option through the administration console. The option is called “Live Data Models: Enable Smart Grouping and predictive forecasting in Time Series Charts”. Q: What happens to my data when a forecast is run on a Live Connection? When the user requests a forecast on a Time Series chart, the non-forecast data for the chart is obtained from the customer’s on-premise database in the normal way that data is retrieved to the web browser client for Live Connection. The Time Series visualization on the web browser client will first display with the non-forecasted data showing, and a progress indicator is shown. In the meantime, the Web Browser client will send a copy of the chart’s data back to the SAP Analytics Cloud back-end system. The data will be temporarily stored in a table in the SAP Analytics Cloud back-end system while the forecast is being run. After the forecasting algorithm generates the forecasted data points, the temporary data stored in the back-end system will be removed. The forecasted data points will be sent back to the web browser client, and displayed in the chart, as shown in the example screenshot below. Q: Does the forecasting algorithm run on aggregated, or fact-level / row level data? The forecasting algorithm runs on the aggregated data that is shown and used in the Time Series chart itself. It is possible to change the level of granularity of the data in the Time Series Chart by clicking the icon as in the screenshot above. Q: In which system does the Forecasting algorithm run? The Forecasting algorithm that is used in SAP Analytics Cloud is run within the SAP Analytics Cloud back-end system itself, and does not run on-premise for a customer, or in the web browser client. Q: Is Forecasting supported for Planning workflows as well? I hope this answers your questions about SAP Analytics Cloud regarding Time Series Forecasting and Live Connection. As a member of the SAP Analytics Cloud development team, I am excited about the value our product provides for our customers, and we look forward to hearing your success stories and feedback about how our product is useful for you. If you have any additional questions, feel free to comment below.